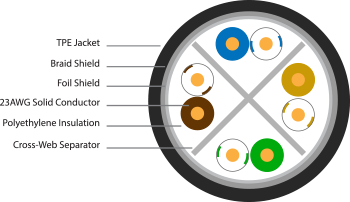 The CN423C6ATFS is a shielded, extra-flexible and rugged Category 6A cable for networking and data applications. Constructed from four precision twisted-pairs, the CN423C6ATFS is tested to meet or exceed TIA-568-C.2 specifications for 10G Cat6A applications. Built with a TPE jacket and 23 AWG solid conductors, the CN423C6ATFS has exceptional flexibility and flex-life characteristics. All values listed in above table are dB/100m of cable except for Delay specification which is ns/100m.